When I was 5 years old, my uncle gave me a dollhouse for Christmas. 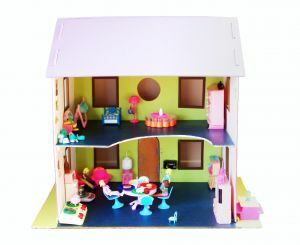 From that point, I was totally hooked on giving my miniature people all the advantages of a real home. Little children played in the nursery, while Mom cooked dinner. They had a stage for their activities. 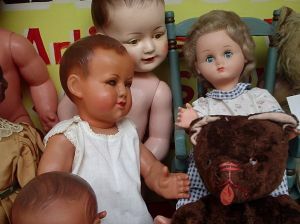 My larger dolls didn't escape my vivid imagination either. When my cousin was born, my aunt passed her outgrown baby clothes on to me. I preferred them to the flimsy doll clothing available in stores. Real sweaters, hats, and booties adorned my darlings. A character without a setting is like a doll without the trappings of real life. Who can forget the curtains Scarlett O'Hara made for Tara? Authors like Cathy Gohlke, Tamera Alexander, and others draw us into their worlds with sweeping vistas and realistic details of bygone years. How can we create a stage for our characters that doesn't resemble a cardboard backdrop? 1) Research, research, research. I know authors, who read books, newspapers, articles, visit museums, and travel to absorb the flavor of their characters' era. 2) Word choice. We would not use King James English in a contemporary novel. Neither would we resort to modern terminology in a historical romance. 3) Interview experts. While working on my first manuscript, I relied on a friend to give me cultural input. On TV, the character, Richard Castle, hangs around a real-life detective for inspiration and accurate details. P.S. DON'T FORGET - TOMORROW IS ELECTION DAY IN THE U.S.! Writers: What techniques do you use to produce great settings? Readers: What does a stunning setting do for your reading experience? Susan, great advice as ususal. I too loved my dolls. For setting, I draw on research and experience (depending on the story). I also observe how other writers handle similar genres. I've watched some YouTube videos on cars in the 1920s and even an interview with a Paiute woman who makes baskets. I'm excited about election day! Very, very concerned, but hopeful. As I'm not a fiction writer, I have to use real-life settings. Which still make my real-life accounts come to life, making them even more vivid in readers' minds, I think. I, too, write non-fiction. I use what is available to depict my point. I intend to do more of this in the future. Hi Karen - At conferences and workshops, it's drilled into us that writers are also readers. We can learn so much from quality authors. Hi Jessica - I never thought of using YouTube as a resource. Great idea! Hi Rhonda - Me too! I think you do a fabulous job drawing people into your day-to-day experiences. Hi Quiet Spirit - Using fiction techniques in non-fiction is a great way to hold people's interest. I enjoy settings with details I hadn't thought about. I love old houses. I get tired reading about too much nature detail, unless it is a major plot point. Hi Nancy - Yes, sometimes the nature detail can get tedious. Hi Dotti - They definitely wore PJ's. :) Research is a key factor for any novel. I think another thing we can do is to choose settings that have special meaning, either good or bad, to the POV character. Their emotions can be manipulated by what they feel in a setting where they feel uncomfortable, or at ease. Whichever will cause more conflict or help or shadow will make a good choice! Hi Sarah - Finding some great, dependable resources might ease the stress. I especially like getting "experts." Hi Angela - Great suggestions! I've seen authors use this technique with amazing results. Great topic and illustration. When I played make-believe as a girl (kind of still do...) setting was always very important to me. The more authentic, the better. Fun to recall. Research is important to me now to authenticate my novels with time, place, and culture. Maybe our early experience was basic training for writing fiction. I think you are right, Susan! LOL!